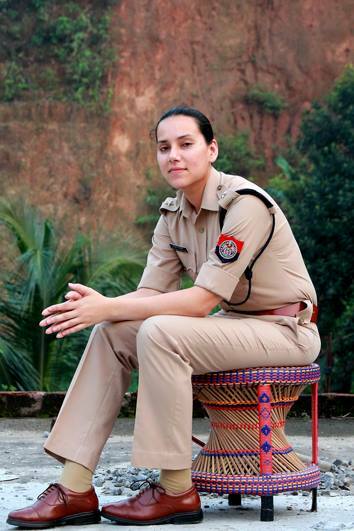 Dr Sanjukta Parashar is the first and only Assamese lady IPS officer to be posted in Assam. Securing 85th position (All India ranking) in the UPSC, she responded to the call of the uniform and opted to join the police service, when most other women chose to join IAS. She was born to Meena Devi, who worked with the Assam Health Services and Dulal Chandra Barua, who was an engineer in the Irrigation Department posted in Dibrugarh. Her parents then moved to Lakhimpur where she spent two years of her early childhood before shifting to Guwahati. She completed her Class X from Holy Child School, Guwahati after her parents shifted to the city. She took keen interest in sports and her mother enrolled her for swimming classes. As a student, she would take part in the sports competitions organized in the school with great enthusiasm. She would also participate in the one-act plays and march pasts. She did her graduation from Indraprastha College in New Delhi. Initially, she was denied admission in the hostel as her marks was below the cut-off. However, after she scored good marks in the ensuring examinations, she was finally granted admission in the hostel. Then she joined JNU in Delhi from where she completed her Masters in International Relations. Realizing that US was the most important nation in the world as far as the world economy and world politics went, she took US-ASEAN relations as the topic for her MPhil. She worked on the economic and military polices of these countries. While working for a group called the Observer Research Foundation in 2004, she began preparing for the UPSC examinations. She would study for not more than five hours but would revise the last lesson learnt. Securing 85th position was a pleasant surprise to her. Within two hours of her joining as Assistant Commandant of Makum in 2008, she was told to move to Udalguri where clashes between the Bodo and illegal migrants from Bangladeshis had broken out. There she realized how one could lose everything in a fraction of a second, simply on account of being born to a particular community. On August 7, 2008 she survived an accident when the gypsy she was driving collided with another vehicle in Dharapur. Parashar calls herself a humble being and wants only the criminals to fear her. Married to Puru Gupta, DC Chirang in 2008, she is currently posted as the SP of Jorhat district of Assam. Dr Parashar is actively involved in social activities and still holds great interest in sporting events. She is indeed an icon for the young Assamese girls whom she motivates in taking up a challenging profession like the Police services. Recently she has undertaken a project to improve working conditions of copsTraffic policemen in the Upper Assam town adopted a “token reward and punishment” mode to ensure that bikers, especially youths, do not violate the traffic rule of wearing helmets. Sanjukta Parasor said she hoped that the move would ensure that two-wheeler riders take to protective gear ,We gave out 300 toffees today and will continue to do so as long as everyone who can afford to wear a helmet does so,” she said. salute to this woman :)!!! Jitni tarif karo utni kam he..mera bhi sapna tha par nahi hua pura..but i love my india..Jai hind..